The museum is surrounded by working fields in every direction. On August 12th, I visited the Bee Family Farm for the first time. 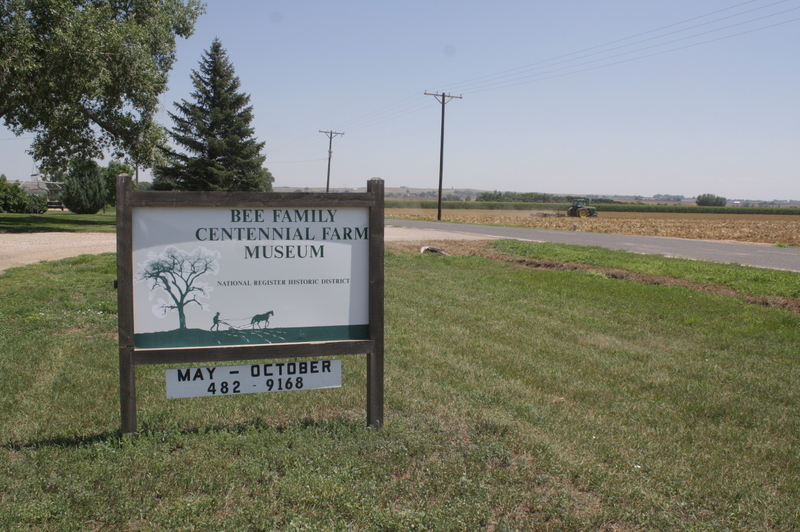 Designated a Centennial Farm in 1994 (for 100 years of ownership by a single family) and added to the National Registry of Historic Places in 2002, the Bee Family Farm is a museum not only of local history, but also of agriculture over the years. 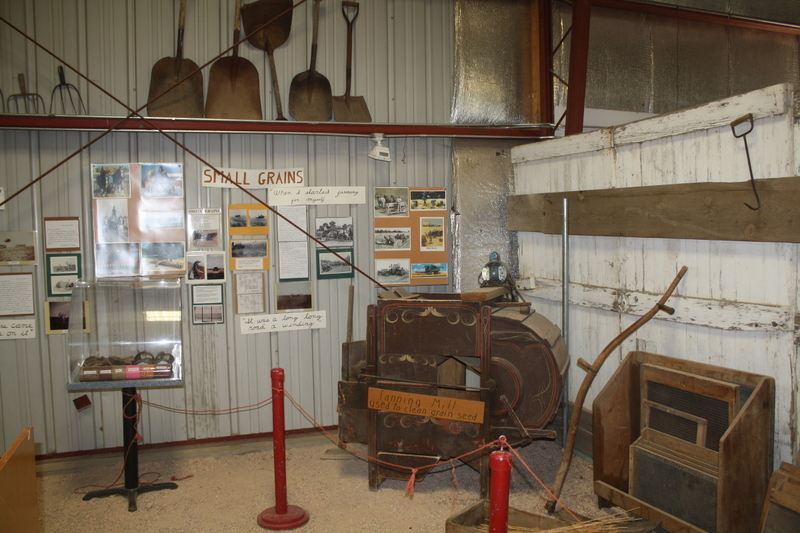 One of the main missions of the museum is to educate people on the history and importance of small family farms. 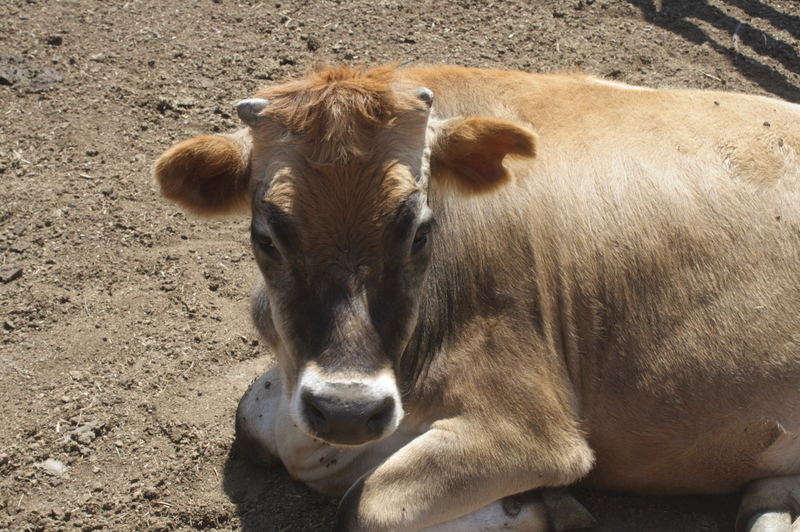 The farm has one dairy cow and a few beef cattle, similar to the kinds of cows raised by the Bees over the years. John and Fanny Bee arrived in Fort Collins from Iowa by train in October of 1882. They homesteaded 6 miles north of town where they grew corn and raised cattle. Corn grew really well their first year in Colorado due to an unusually wet season. But the next 5 years, the corn crops failed and John realized that the dry climate called for irrigated fields. So he rented an irrigated farm, moving his family to where he could grow the crops he was familiar with from his time in Iowa. He held on to his homestead property, though, and in 1902, the North Poudre Irrigation Company traded for the land in order to create a reservoir in that location (now called the Bee Lake Reservoir). In return, the Bee family was given shares of water for irrigation. A fanning mill is used to clean grain seed. Fanny Bee encouraged her sister, Lizzie Morse, to move to the area. So in 1884, Lizzie and Al Morse, and their son, Whitwell, moved to a plot of land 2 miles east of where the Bee Family Farm is today. Al raised horses and provided teams for irrigation projects in the region. In 1894, the family moved to a new plot of land to where the Bee Farm stands today. They homesteaded the land based on the Timber Culture Act of 1873. The Timber Culture act worked on the flawed assumption that because the East had a lot of trees and a lot of rain, trees must be what brought the rain. So land was given to homesteaders who planted and maintained a certain number of trees. The pig enjoyed a bath while we were getting our tour of the farm animals. Soon after moving to the new homestead, Whitwell fell ill and died of typhoid. Al Morse died five years later. John and Fanny’s son, Arleigh Bee, had often helped his uncle Al with the teams of horses. After Al’s death, Arleigh moved to his aunt’s to help run the farm. In 1902, when the Bees traded their original homestead to the irrigation company, they moved their whole family – and even the family house – to Aunt Lizzie’s property. Arleigh and Selecta’s marriage was announced in the December 2, 1908 Weekly Courier. Fanny Bee died in 1905 after being struck by lightning. John passed away a year later of a broken heart. Selecta Shaw, Al Morse’s niece, moved to Colorado to help Lizzie Morse with the housework. In 1908, Arleigh Bee and Selecta were married. Over the years Arleigh grew alfalfa, beets, and pinto beans. He started lamb feeding in the 1920s and his son Francis started a dairy in the 1930s. The Bees also raised beef cattle for a time. 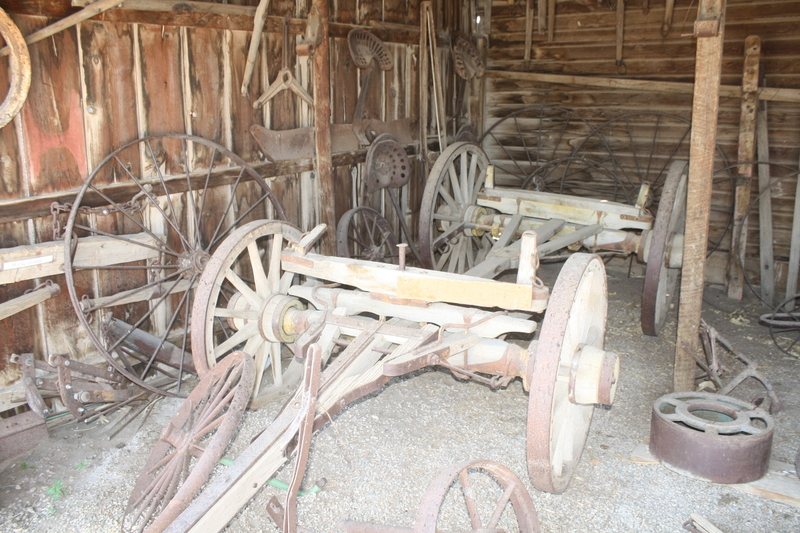 Arleigh took care with his farm equipment and tools and appeared to have rarely thrown anything away. 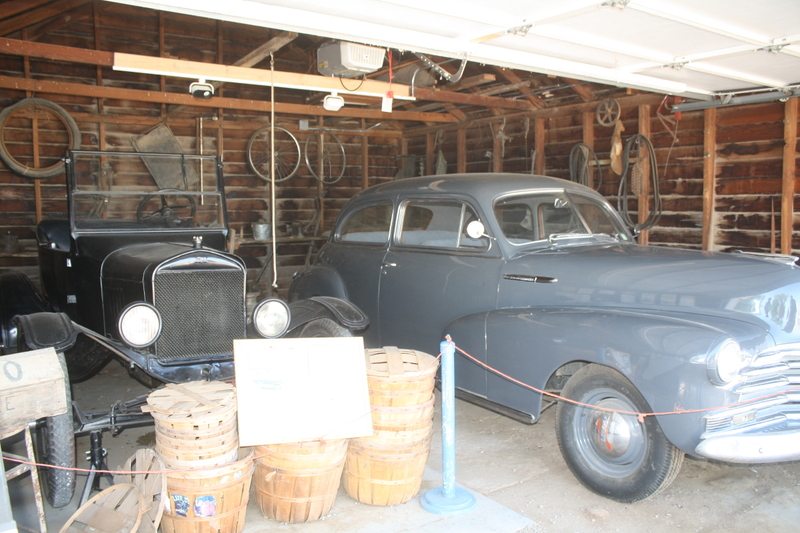 Thanks to his use-and-reuse philosophy, the museum is full of farm equipment and the house is full of odds and ends that are all original to the Bee family. In fact, only about 2% of the items on display were donated to the museum. Everything else belonged to the Bee family and was used right there on the farm. I don’t think I’ve ever been to another museum that could boast such a thing. It really helps to give a sense of the strong philosophy of stewardship for the land that this family embodied (and continues to embody today by creating this museum and using it as an educational tool). Kids can check these chicken nests for eggs. There are a lot of things kids will enjoy at this farm. 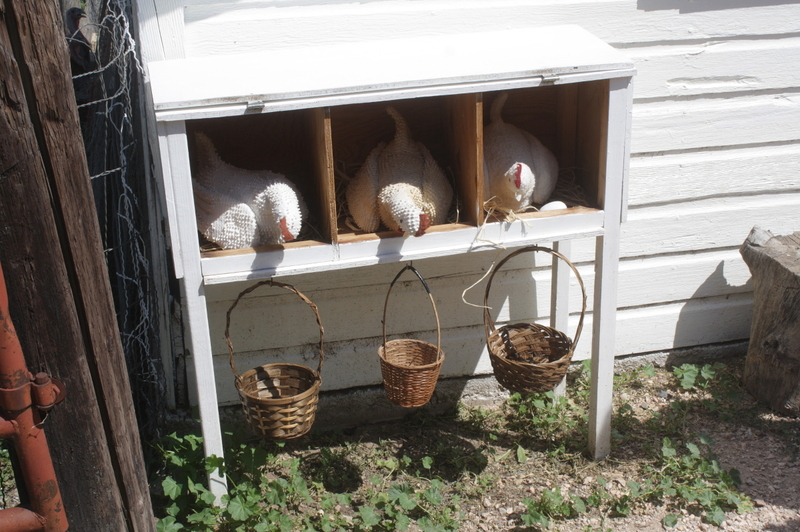 In addition to chickens, turkeys, sheep, cows, a pig and a house cat, there are numerous displays including a few hands-on activities like reaching under crocheted chickens for eggs or milking a wooden cow. But apparently the station the kids love best has to do with irrigation. Our tour guide was able to create suction in a pipe and get water to feed over the wall of this irrigation station. A lot of the farm land that belonged to the Bees has been sold to Colorado State University and is now part of the Agricultural Research, Development and Education Center of CSU. There’s a Conservation Easement with the county on the rest, which means that the farmland will remain farmland even if it’s sold to new owners. As you tour the buildings in the museum, you’ll see two different houses that the Bee family lived in as well as several of their personal affects (including a baby crib that the mom could pull right over the edge of her bed for easy access to the baby). There’s a lot of old farm equipment, but there’s also old kitchenware, ration stamps from World War II, an old rug beater and all sorts of other things that kids have probably never even heard of before and that will bring back fond memories among the more *cough* mature museum attendees. 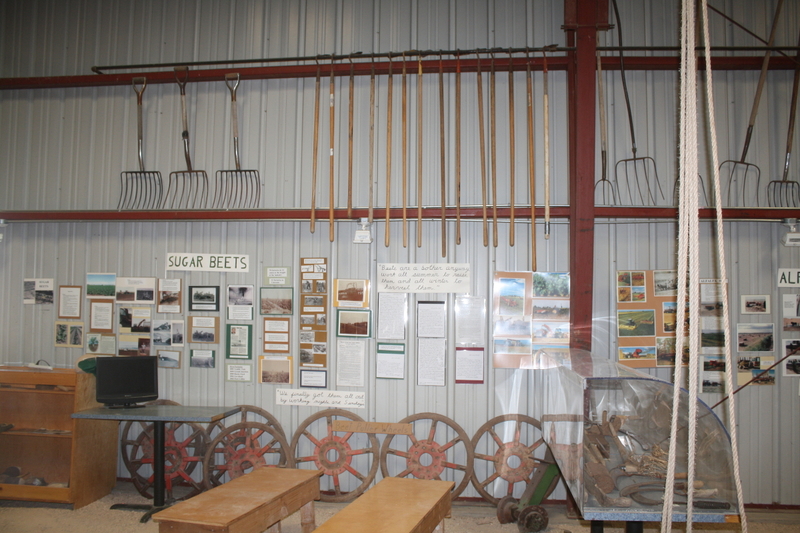 A string of farm tools act not only as a museum display, but also a form of decoration over a series of information cards about beet farming. Most (if not all) of the information around the farm was put together by members of the Bee family. There are descriptions of tools that were used out in the fields, of how chickens were cared for, how beets were harvested and how grain was cleaned. 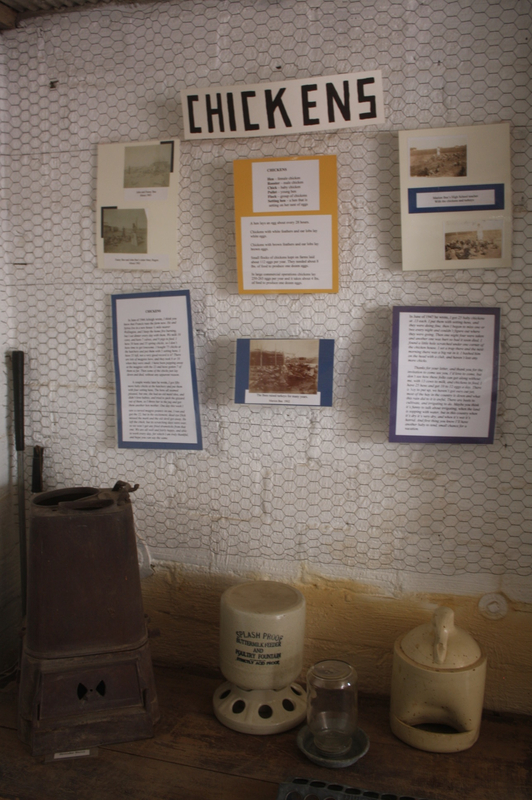 There are also notes inside the two museum houses that give a sense of the family’s life and of the general time period that the farm was in operation. I visited on a rather hot day and the chickens were mostly huddled around the food and water inside their coop where at least they had some shade. Old feeders and other items were on display in a nearby barn. The Bee family bought their first car in 1916, their first tractor in 1930, and their first truck in 1933. 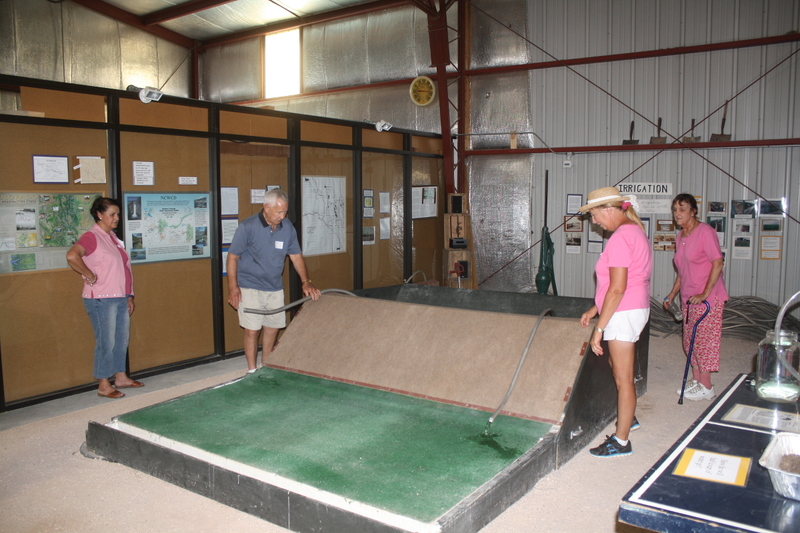 They were also one of the first farms to run an irrigation well in 1910. The Bee Family Farm is open from May through October on Fridays and Saturdays. Stop by between 10am and 4pm. The entrance fee is $7 for adults, $5 for seniors (60+), and $3 for kids (3-12). Under 3 are free. Or swing by on September 27th, which is Pioneer Living Day. (10am – 4pm) There will be spinning, quilting, blacksmithing, craft and vendor booths, and tours of the farm and farm houses. Bring a picnic lunch and enjoy the activities. Lemonade is provided and ice cream is available for a small donation. I’d also encourage you to check out the farm’s website. There are two videos there about the history of the family and the farm as well as all sorts of little history and agricultural related tidbits of information and lots of cool old photos. They also have a Facebook page with regular posts of interesting farm info, photos of items from around the farm, and historic tidbits. The Facebook page is definitely worth a “like”. If you visit the farm, or have already visited it, I’d love to hear what you liked best. Add your thoughts and stories in the comments below (or on Facebook or Google+). Sometimes I choose stories to write about that I think you all might find interesting. And sometimes I pick stories that start out as questions that get stuck in my craw and I just can’t seem to rattle them lose without a little research and some answers. I think I’d like to answer one of those little niggling questions next week. The only problem is that if the answer turns out to be boring… well, that’s not going to be worth writing about. Soooo, I’m going to try to bring an interesting story about “a building of unknown purpose” next week. But if that falls through (or bores me to tears) you can expect to learn a little about the history of Wellington. That’s my current back up plan, at least. Why Wellington? Why not. If you liked this agriculture related post, then you might want to check out Farming Fort Collins – another blog in the Scoop Blog Network. And if you liked finding out about a place where you can take your kids or grandkids for a day, then you might want to check out Growing Up Fort Collins – also a member of the Scoop Blog Network. I toured the farm on August 12th with the Colorado History Connect group in northern Colorado. Liz Harrison (granddaughter of Arleigh Bee) was our hostess for our meeting and tour. I took all of the above photos during that tour. Thanks, Liz!!! I also checked in on the Bee Family Farm website for specific details. The videos at the bottom of the home page are worth watching. And like I said above, the Bee Farm Facebook page is a good one to follow. You’ll learn a little something. I promise. The newspaper clipping came from the December 2, 1908 Fort Collins Weekly Courier. I accessed it through the Colorado Historic Newspapers site online.